Office 365 provides an incredible amount of value to individual employees, teams, departments, and organizations. Much of this value is not realized immediately upon purchase or deployment of Office 365. The value is realized as more and more users understand, adopt, and embrace the technology. So how do we drive faster, sustainable and effective adoption? 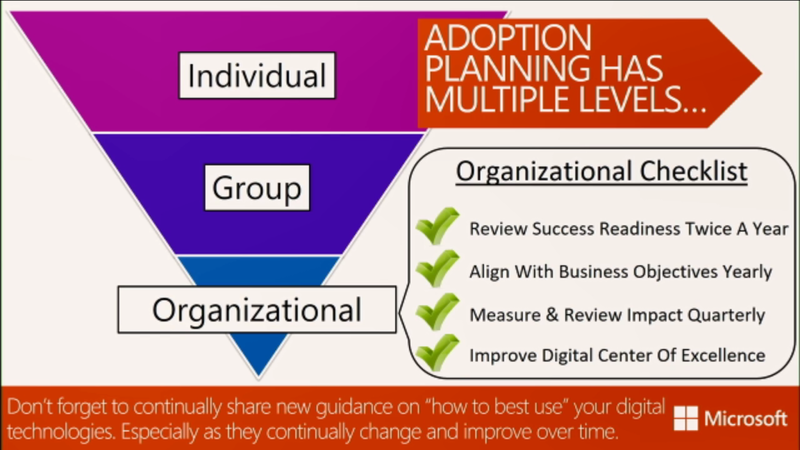 Perhaps more importantly, how do we ensure our adoption approach scales and can keep up with the innovation the Office 365 service provides? The last one, “A Digital Center of Excellence” is something we clearly lack at GRE. They suggest a central hub to build as a single source of training for users. There is this very detailed adoption strategy that is apparently available and free at this website. And here’s a kit for measuring adoption that is also available and free. This entire presentation brings to light the lack of ownership we have with this whole effort. If that was not already obvious from the SPOC meetings. Not only is there an aspect of communications, but there is training, and measurement of adoption. Honestly, I’m cool with taking the “build it and they will come” approach. Or the piecemeal approach, whereby we train folks on an as-needed basis, but there has been a heavy emphasis on warning against these approaches. Even the presentations that had training/adoption listed nowhere in the description, still made mention of it.